Trials currently closed in Yosemite. Yosemite National Park in California is on fire. Highway 41 between Oakhurst & Yosemite is closed. Glacier Point Road is closed. Mandatory evacuations are in place for the community of Sugar Pine and Sugar Pine Camp with an evacuation advisory for the community of Fish Camp. There are 100 structures threatened. Highway 41 is in a hard closure from Westphal to the South entrance to Yosemite National Park. Yosemite visitors are to use Highway 49 and Highway 140 for entrance to the National Park. Presently the fire has consumed approximately 1000 acres and is 5% contained, cause of the fire is under investigation. Assisting Agencies: CAL FIRE, Madera County Sheriffs Office and Madera County Fire. Tomorrow at approximately 1000hrs a Type 2 Incident Command Team (IMT), will take over the incident command from the Sierra NF. photo of South Fork Fire on 8/22/17. 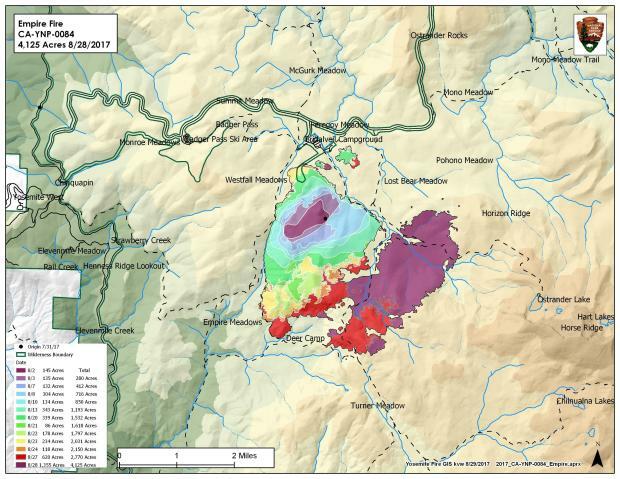 Map of South Fork Fire. The north flank of the fire was the most active yesterday as it burned into heavy pockets of fuel. The south and west flanks of the fire are contained, some smoke will be visible as logs and brush burn in the interior. Crews will continue to patrol and monitor the flanks closest to the community of Wawona and Mariposa Grove. Crews are continuing containment strategies on the north-west edge of the fire and to keep fire south and south-east of Chilnualna Creek. 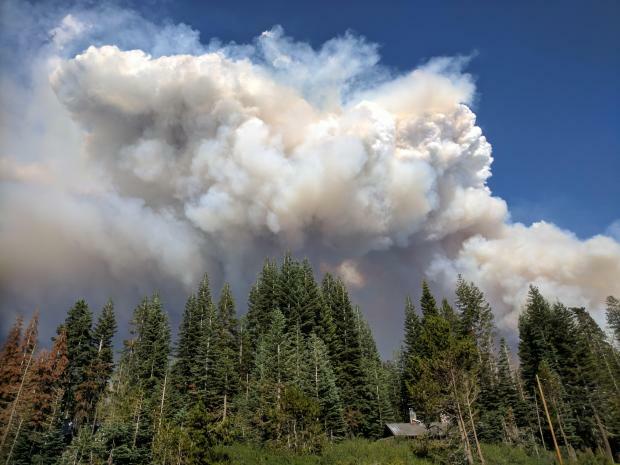 The north and east flank of the fire is continuing to burn in the wilderness, and will be monitored by aircraft due to inaccessible and steep terrain. As fire continues into the high country it will hit some pockets of heavy vegetation with little fire history but slow down with natural granite barriers and sparse vegetation which will limit smoke production. This high country wilderness area has few high values at risk. •The Swinging Bridge Trail on both the north and south sides of the South Fork of the Merced River. •The Chilnualna Falls Trail from Wawona Trailhead to the top of Chilnualna Falls. •The two mile connecting trail heading north from the top of Chilnualna Falls to the intersection of the Buena Vista Trail. •The Chilnualna Creek Trail from the top of Chilnualna Falls east to the intersection of the Buena Vista and Buck Camp trails (Just east of Johnson Lake). •Off-trail areas in the vicinity of the South Fork Fire Area, including the swimming holes north of Chilnualna Creek. • All climbing routes on and around Wawona Dome are closed. Mop up and suppression repair on the west flank of the fire. Monitor and check the fire spread near the S. fork of the Merced River on the SE side of the fire. Monitor fire spread on the north and east flanks. Crews continue to hot spot and cold trail the southeast portion (Div J) in an effort to halt the eastern spread of the fire. Weather is forecasted to get hotter and drier with expected increases in fire behavior until the high pressure system moves out and clouds and moisture move over fire area.The fire is located in the South Fork of the Merced River, with very steep and inaccessible terrain. A strong upper level ridge of high pressure centered over the Great Basin will continue to bring well above normal temperatures and light, terrain-driven winds to the fire through Tuesday with little diurnal change in humidity. A southwesterly flow aloft will become established over the fire by this afternoon and remain westerly through midweek as a weak upper level trough passes by to our north. Although a few thunderstorms could pop up over the higher elevations of Yosemite Tuesday and Wednesday, they will remain well east of the fire. Map of Empire Fire 8/29/17. Due to a very dry air mass fire activity increased yesterday on the eastern flanks of the fire burning in heavy pockets of down and dead vegetation. The west and northwest flanks of the fire are contained and showed minimal activity. 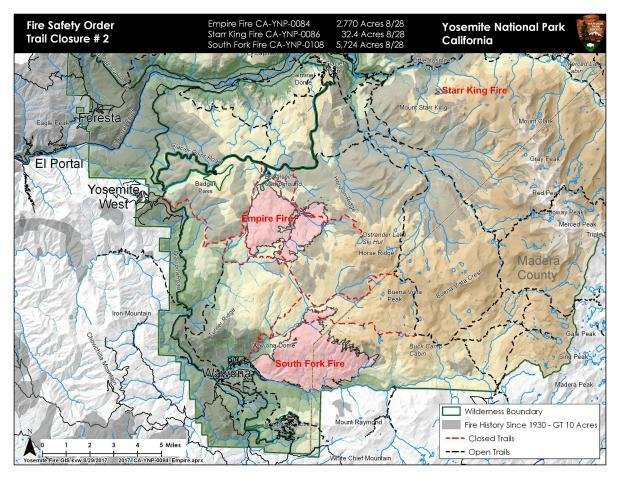 Fire crews are implementing a perimeter control strategy for the north, west, and southern flanks of the fire to protect Bridalveil Campground, Yosemite Ski and Snowboard Area, Yosemite West subdivision, Wawona Road (Highway 41), and Glacier Point road. 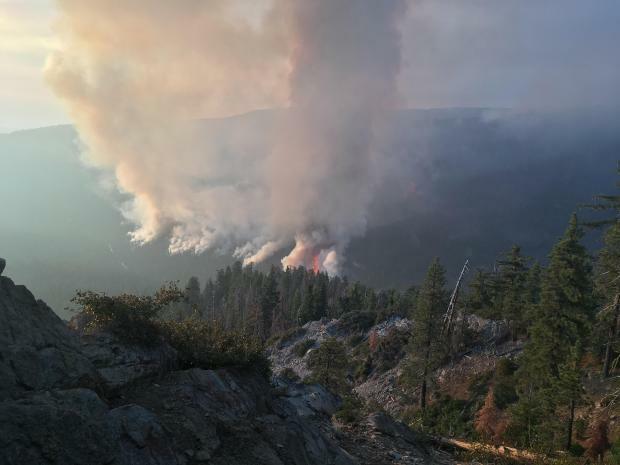 Strategy for the east flank of the fire is to steer fire east deeper into the wilderness where there is sparse vegetation and natural granite barriers which will slow spread and limit smoke production. This high country wilderness area is very steep and rugged and has few high values at risk. Fire management personnel is implementing this strategy on three sides of the fire to limit further smoke production in heavy fuels..
Today crews will be working to secure the Deer Camp trail from Alder Creek east for 3/4 of a mile. Glacier Point road is closed to the public due to fire fighter safety to conduct tree felling and vegetation clearance. Additional crews and engines are on order to support these operations. All closed trailheads and junctions will be posted with a trail closure order and map. of the 50 acre spot fire to the east of Bridalveil Creek Campground. 24 hours: Continue firing operation on the south flank from the area of Turner Meadows toward Deer Camp. 48 hours: Complete all firing operations by end of shift hold line and monitor fire. 72 hours: Continue to reevaluate fire behavior hold and monitor fire . Crews will be strategically positioned to monitor fire and allow the fire to naturally progress east further into the wilderness. evening thunderstorms over the higher elevations of the southern Sierra Nevada through Thursday. There are multiple fires burning in Yosemite National Park’s wilderness Smoke will be present due to a high pressure system which brings higher temperatures and lower relative humidities. Thunderstorms are possible over the high country. Thunderstorms bring gusty winds and hazardous lightning. Area and trail closures are in place follow posted closure orders and maps. Fire management personnel is implementing this strategy on three sides of the fire to limit further smoke production in heavy fuels. Area and trail closures are in place including: Glacier Point road, Bridalveil Campground, and multiple trail closures. Activity has picked up and smoke will be visible from Glacier Point, Washburn Point, and Sentinel Dome. 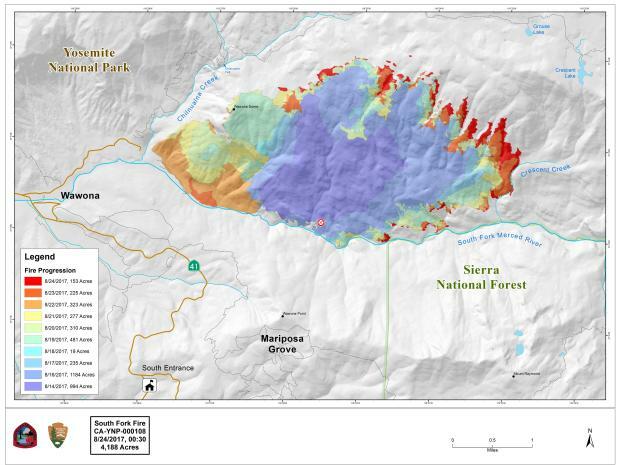 Location: N 37° 49.336′ x W 119° 34.720′ at approximately 8154 feet elevation off Tioga road near Yosemite Creek Campground road, creeping and smoldering, burning in large logs which are creating smoke. I saw that too, LOL. Someone didn’t proofread.. I saw the original Yosemite Firefall. Bad journalism. 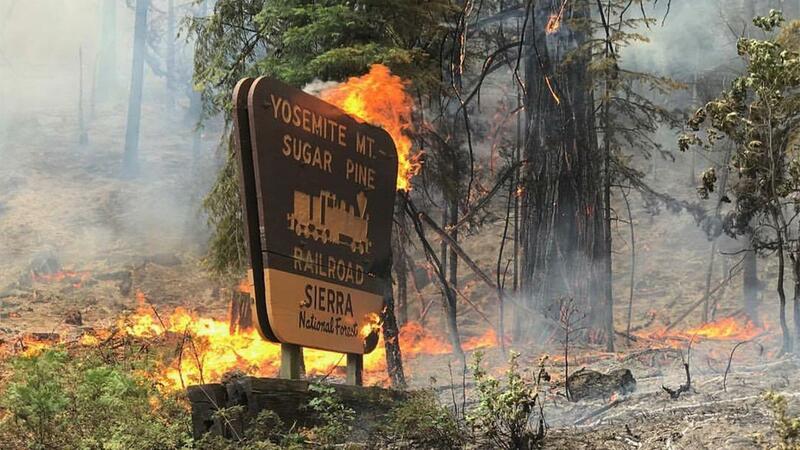 The Railroad fire is not in Yosemite. The park is the size of Rhode Island, and, yes, there are fires in the wilderness because of lightning strikes, but your headline is inflammatory and unnecessary. Fire is a natural part of a wilderness and most of them don’t approach populated parts of the park. The South Fork and Empire fires were exceptions. Some roads have been closed and are opening up today. I notice you use YNP reports to bolster your story without really identifying where all these fires are. Most are in unpopulated wilderness with no threat to human life and little to no impact on visitor areas. When is BLM sending support?